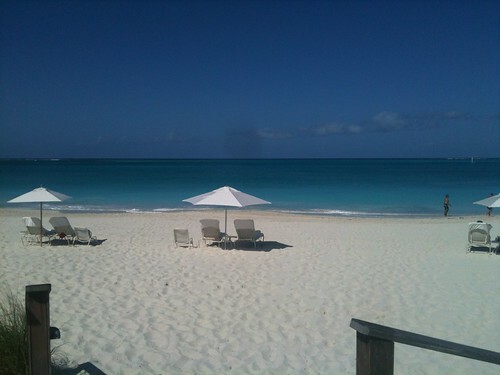 A couple of weeks ago I spent the week in the Caribbean, in the Turks and Caicos islands. 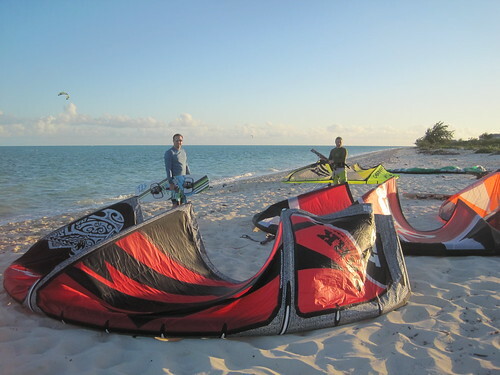 I went with a handful of fellow kiteboarders, and we stayed in a private villa on the southeast tip of the main Caicos island, about 15 minutes driving from Providenciales, the capital. The trip was a blast. I won’t cover all the details here, but even so this will likely be a boring post for most. It’s more for my own record, for future trip planning. The villa itself and its location were great. It’s on Long Bay, which is the undeveloped side of Caicos, the opposite side from Grace Bay where all the big resorts are. This means we had the beach entirely to ourselves most of the time. And by that I mean literally just us, no one else. The water at our beach, and everywhere else, was amazing. Very clear, very clean, 78-80 degrees all the time. You don’t need a towel, even, as you can just air-dry without a problem. 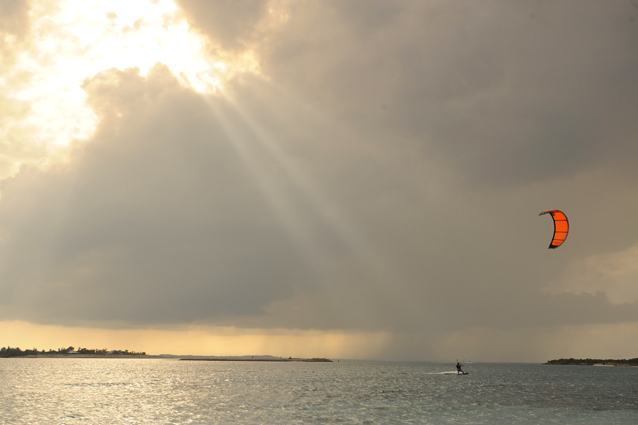 We were swimming, kayaking, SUPing, and obviously kiteboarding, in the water for most of every day. The villa owners, Ritama and Kabir, live there, and they’re super nice. They were great hosts, and they both kiteboard themselves, so they’re aware of the gear and the setup required. This was one of the reasons we chose this specific villa. Specifically, they have a variety of light-wind and beginner boards (read: big boards), suitable for beginners like me in all conditions. That means you don’t have to bring your big board on the plane, freeing up space in the gear bag for other things. Good to know for the future. They also have a working air compressor right on the beach, so you can power-inflate your kites without needing a manual pump. This is a nice luxury. Kabir fixed the hose on the compressor right away when it ripped, too. Of our 7 days, about 3 days had awesome wind all day, and 2 had wind that was too light for me as a beginner, but the other folks in the house still got out there. That’s a lot of riding, more than we expected. Kiteboarders are always at the mercy of the wind, and it was plentiful this time around. On the low-wind days, I went scuba diving, and had some of the best dives of my life. 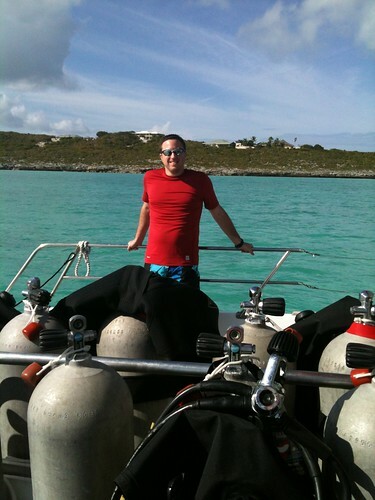 I used Caicos Adventures, on the recommendation of fellow divers from Boston, and they were great. Fifi, the owner with the funny nickname, is a great guy. The big catamaran boat they have for serious dives is excellent: new, clean, really well-equipped. The dives were amazing: lots of fish, big and small. We went fairly deep, saw plenty of (non-human-eating, hopefully) reef sharks, spotted eagle rays, big eels, and more. The water is again clean and clear, with great visibility and warmth. I was very comfortable in my 3mm shorty wetsuit, even at 100ft depth. The wall dive concept is fun, too. There’s a very “Abyss” feeling to it at first. I also did a lot of SUP, stand-up paddleboarding, and improved my skills there. I find it pretty calming and a good workout at the same time. Most days all of us were up at or near sunrise, to do a so-called “dawn patrol.” This is often when the water was smoothest and calmest, making for good times if there’s wind. We’d make breakfast in the villa or head to town for a diner we liked. (The above picture is from Kiteboarding Magazine, who went to the same area we were last year, and the kite is just about the same as mine. I hope Luke and the magazine are OK with this attributed use ;)). Most nights we tried to go out, but there wasn’t much in terms of night life. This was fine since we were tired from the long day on the water, but I found it surprising. We thought it’d be high season, but most of the bars / restaurants we checked out were nearly empty. It doesn’t seem like a late-night scene, making it different from Cabarete, another noted kiteboarding destination. There was much guy bonding, naturally, making for a very fun trip. We’re already talking about plans for the next one, with some folks going to Hatteras later this year. I’m not joining that trip, but I’m sure I’ll see this crew again. We have plenty of video and still footage, but it’s dispersed among many cameras, and we haven’t exchanged them yet. I hope we’ll do that soon, and then I can post some stuff here.